One of Parents Magazine's Ten Best Children's Books of 2015! Although Drew Daywalt grew up in a haunted house, he now lives in a Southern California home, haunted by only his wife, two kids, and German Shepherd. A Hollywood screenwriter by trade, The Day the Crayons Quit was his first book for children. His favorite crayon is Black. Oliver Jeffers (www.oliverjeffersworld.com) makes art and tells stories. 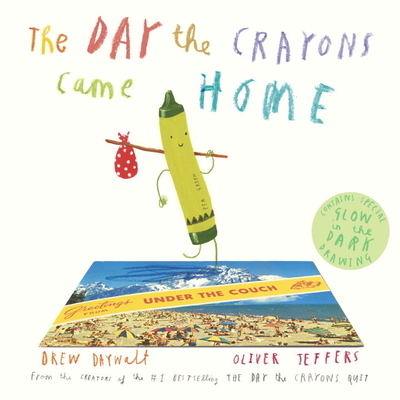 In addition to The Day the Crayons Quit, his books include How to Catch a Star; Lost and Found, which was the recipient of the prestigious Nestle Children’s Book Prize Gold Award in the U.K. and was later adapted into an award-winning animated film; The Way Back Home; The Incredible Book Eating Boy; The Great Paper Caper; The Heart and the Bottle, which was made into a highly acclaimed iPad application narrated by Helena Bonham Carter; Up and Down, the New York Times bestselling Stuck; The Hueys in the New Sweater, a New York Times Best Illustrated Book of the Year; and This Moose Belongs to Me, a New York Times bestseller. Originally from Belfast, Northern Ireland, Oliver now lives and works in Brooklyn, New York.